It automatically logs me in as a particular user and I see no way to change it. I tried signing off in the roku channel, but then I go back in and it won't connect. It says retrieving... for about a minute then just kicks me out of the channel. The only way I can get it working again is to uninstall the channel and reinstall. Then I'm back to square one again. What is the app version number? Have you tried going to preferences in the app and turning off Remember User? Have you tried the preferences? Remember user defaults to yes. Edited by speechles, 27 June 2015 - 08:13 PM. Tried adjusting the setting to not remember the user, but it still has my other user signed in. If I sign out, I can't get back in. 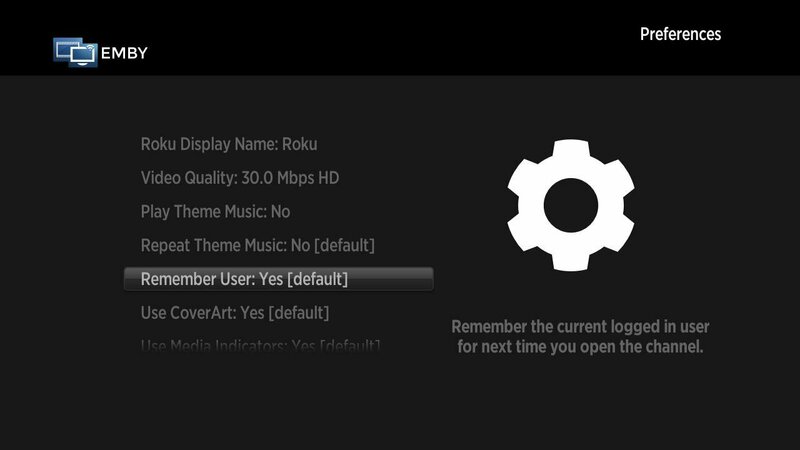 Just says "retrieving..." for a while and then kicks me out to the Roku main menu. Can you grab a lot from the roku? I'm not sure how helpful this is, but I can confirm that I have the exact same issue on a Roku right now. Unfortunately, I'm visiting my parents so can't get any access logs or anything (since it's their Roku), but at least I can confirm that it's not an isolated incident. The normally connect with their Roku 2 into my Emby server at home, with no problem. This evening I connected in (with their account) with no problem, went to sign out (to change to my own account), and now when I try to launch the Emby app it just hangs on "Retrieving..." as described above. I tried to remove and reinstall the app (to ensure I had the most recent version), which didn't help. Then I tried to install the latest Beta of the app, and it still reproduced the same issue. It would appear that there's a problem with the central login server that it's trying to connect to (since it's not even prompting me with a chance to login so that it can go looking for my server. A long shot maybe, but is there any chance that it has something to do with the domain name change from mediabrowser.tv to emby.media? Anyway, sorry that I can't provide a log or anymore info, but when it's not technically my Roku box, I'd rather not fiddle with side-loading anything onto it for logging purposes. But I can at least corrolate that this is not an isolated issue, and hopefully somebody else with a logged Roku will be able to replicate the issue and give you the logs that you need.